Ukraine has taken “fake news” to a new level. Nevertheless, it might end up being the best thing that ever happened to journalism on the Russia/Ukraine beat. MOSCOW: So, Arkady Babchenko is alive. And that’s really good news. Especially for his wife and six children, who were also led to believe the Russian journalist had been brutally murdered in Kiev. Russian journalist said to be killed shows up at a news conference very much alive. However, this sordid little episode badly exposes Russia conspiracy nutters and chancer hacks, who have been taken seriously for too long. And it also shows casual observers just how dreadful standards are of western reportage from Kiev and Moscow. Because it’s long been clear that most hacks focused on these parts believe Russia only lies and its opponents always tell the truth. And, in this regard, this “Lazarus” moment in Kiev may have mortally wounded the hive mind which seems to govern their coverage. It’s a strange little community, that appears more interested in hanging out together and glorying in confirmation bias than actually engaging with Russians and Ukrainians themselves. One programmed to frown on dissent or original thought, quietly enforcing a party line its members are afraid to violate for fear of extinguishing future employment prospects. Well, they now have egg on their faces. Because blind trust in Kiev has governed most western coverage since the US-backed regime took power in 2014. And it has always contrasted with the outright hostility shown towards statements from Russia, or other states out of favour in Washington and London. Ukraine’s narrative in recent years has been that you cannot believe Moscow, whether it’s about the horrific MH17 disaster, Russia’s reintegration of Crimea, or alleged election meddling abroad. But now Kiev has told us that a man they claimed was murdered is actually alive and his fake death was staged to entrap Russians. Except, of course, the alleged planned perpetrator they’ve arrested is Ukrainian. 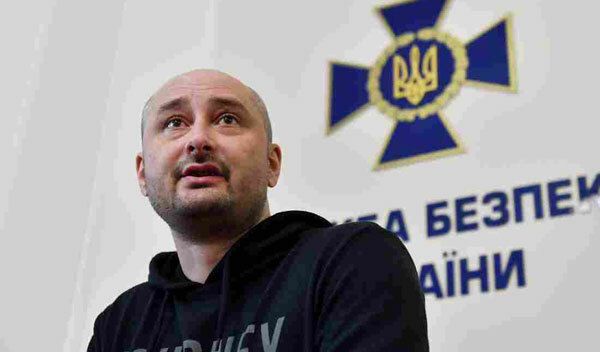 Indeed, Kiev even went so far as to publish a photo of a “dead” Babchenko lying in a pool of “blood.” Which was beyond the call of duty, given how you don’t actually even need to fake a death for a sting operation: you could, for instance, just follow the would-be assassin and arrest him on his way to the scene of the putative crime. And here the absolute ineptitude of Kiev beat hacks is also shown up: did it not occur to them to look for a source who had seen and identified the body? As for Babchenko himself, his own role in the farce took journalistic ethics and torpedoed them. Because the main element in this gig is trust, and he will hardly be trading on his credibility going forward. The murder of Putin critic Arkadiy Babchenko is a test for Western officials on the eve of the World Cup. Will they go to Russia to shake the murderer’s hand coated with fresh blood? He wants to humiliate them, he wants them to shake his bloody hand. That would be his victory. This was tabloid tosh of the lowest order: in fact, spookily so. Another interesting part of the debacle is the contrast between Western media reaction to a faked murder of a Russian-exile hack and its lack of concern for other journalists who have been harassed, threatened, beaten and murdered in Ukraine while the Kiev authorities got a free ride. For example, how often do you hear of Pavel Sheremet, Oles Buzina and Andrei Stenin? As it happens, it also raises serious questions about why the mainstream press has taken at face value Kiev’s assurances regarding the Maidan shootings and the subsequent Odessa massacre in 2014. In a crazy 24 hours, we had Ukraine proclaim a Russian journalist murdered, blaming the Kremlin, and then the following evening insist it was all a bit of a lark apparently inspired by Sherlock Holmes, and the man concerned is alive and well. Media coverage of the idiocy begs one serious question: do facts matter, at this point, or can reporters, columnists and their outlets, just repeat what they believe to be true, because they have already decided that Russia is always the bad guy? Or, are we finally going to admit there is a serious problem in coverage of Russia and its neighbours, and it’s time for a major clear-out of journalists and analysts who repeatedly get things wrong and expose themselves as completely out of their depth? If so, the Babchenko case could yet have a silver lining. But don’t hold your breath.